Are there albums and artists that you have to listen to at a certain time of year? For me, Dean Martin is the voice of autumn/early winter. 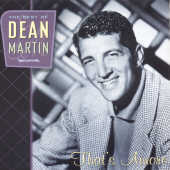 I can’t explain it other than to point to the fact that I bought my first Dean Martin CD in the Fall of 1998 and then listened to it non-stop all winter long. Now it’s just the thing to do in my world. Fast-forward to November 3, 2004. I was on the road with Special K, Dave (of “Dave and Kari” fame), and other WSUMers en route to the College Broadcasters, Inc. annual convention in Nashville, TN. It was my turn to pick out the music we’d listen to in the van. I offered to turn down the opportunity because I knew my CD collection was… eclectic. But Dave insisted it was my turn to pick out the music. I handed him my copy of That’s Amore: The Best of Dean Martin — a.k.a. my “must have” album for that time of year. Dave shrugged and said, “Alright…” as he put it in the CD player. I think maybe three and a half tracks played before he dove for the “eject” button and it was the next person’s turn to select the playlist. But that’s not to say this album isn’t worth a listen. I’m just saying it may be best enjoyed on your own… or in any other context besides 6 hours into on a 14-hour road trip with others who much prefer the congested, speech impediment-laden stylings of The Decemberists. What’s a “Best of Dean Martin” compilation without “That’s Amore” — arguably his biggest hit? If you’re tired of that song, do what I do and flip ahead to the next track or turn on the ‘random’ playback feature of your MP3 or CD player. Other familiar Dino songs you can expect to hear include, “Volare,” “Sway,” “Return To Me,” and “Memories Are Made Of This” (a.k.a. the one that’s overplayed on AM radio). There are hidden gems, too, which make this album my favorite Dean Martin collection out of the three that I own. Call me outlandish, but I think Dean Martin’s version of “Canadian Sunset” surpasses Andy Williams’ by leaps and bounds. It’s much more delicate, romantic, and embodies the sentiment that I imagine the lyricist (Norman Gimbel) intended to evoke when he wrote it (this is pure speculation; I haven’t done any research into Mr. Gimbel’s intentions). And the solo oboe lightly dancing around in the background is just adorable. Another favorite is “If Love Is Good To Me.” Folks who wish to put on their dancing shoes can find this and other danceable numbers on Dean’s aptly-named album, Cha Cha de Amor. The CD wraps up with the best version of “My One and Only Love” that I have ever heard. I mean, seriously. It beats out Sinatra, Johnny Hartman, and countless others who otherwise make you melt like butter. The arrangement features a flute theme that supports Dino’s melody line, an orchestral bridge that will sweep you away, and is ultimately held together by a small cadre of soft bongo beats in the backdrop. Yes, it all sounds strange in writing, but you absolutely must take a listen to hear just how wonderfully this number comes together. Unlike with other songs, Dino doesn’t lay the schmaltz on too thick– his smooth vocal treatment and the arrangement’s instrumentation come together in perfect balance to create what I think is one of the most romantic songs of all time! For some, Dean Martin is a “love him or hate him” kind of artist. I don’t know about that, but I can see how his style might be aggrevating to some. The relentless vibrato, the faux-Italianization of songs that should be left well enough alone, the mispronunciation of Italian words that were supposed to sound authentic in the first place — I’ll admit that his best work is comprised of songs that don’t possess these traits. But when considering the overall purview of his recording history, the good outweighs the not-so-impressive, in my opinion. That’s only five out of twenty tracks. I really think you’ll find the rest tolerable, if not downright enjoyable. Give it a spin and enjoy the warmth that Dino’s voice brings amid the autumn’s winter chill! Final thoughts: This collection only scratches the surface of all that Dean Martin recorded. Just when I think I’ve heard it all, Paul Snyder winds up unearthing something new to me on his blog! Use That’s Amore: The Best of Dean Martin as a primer and keep exploring more of Dino’s work when you’re ready to give your music collection another boost. “Standing on the Corner” is pretty irritating. The first Dean collection I had was that 30-track collection: “Dino: The Best of Dean Martin,” and that song is always one I skip. The interesting thing about his career is that the compilations tend to perform better than the proper albums. You can look at Sinatra and Darin and pick out particular albums and go, “This one is solid top to bottom,” but Dean always had a few stinkers that make him miss perfection. He got close, but he never nailed it. STILL, if you’re really interested in him, you have to look through every album because along with the throwaway tracks he also buried absolute gems that none of the annual “Hey! Dean Martin was COOL!! !” compilations seem to touch (“Carolina Moon,” “Who’s Your Little Who-Zis!,” “Heaven Can Wait,” “C’est Si Bon,” “Louise” …. the list goes on). When you discover those ones, there’s great personal satisfaction that’s hard to get elsewhere. Hey pallies, likes how refreshin’ to find ‘nother pallie who likes totally totally “gets Martin.” Thanks for sharin’ your Dino-passion with your readership. Never was, never will be anyone as cool as the King of Cool….oh, to return to the days when Dino walked the earth. Know that your Dino-reflections are bein’ shared this day with all the pallies at ilovedinomartin.